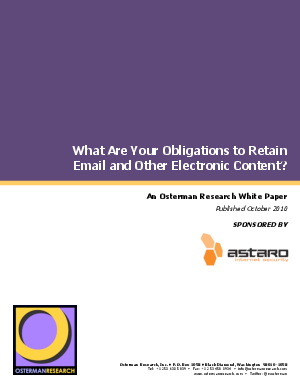 Research Library > Astaro > What Are Your Obligations to Retain Email and Other Electronic Content? IT decision makers need to understand that retaining email and other electronic content is necessary to satisfy litigation and regulatory compliance requirements, not to mention the growing demand for valuable business knowledge constantly being mined by an organization’s employees. This white paper discusses what drives organizations in both heavily-regulated and less regulated industries to retain email and other electronic content. It explores the content retention challenges faced by those organizations in the midst of stringent litigation and regulatory compliance demands. And it offers practical advice for organizations that seek to address those challenges.